We are experts in hail damage inspections and repairs of any size. 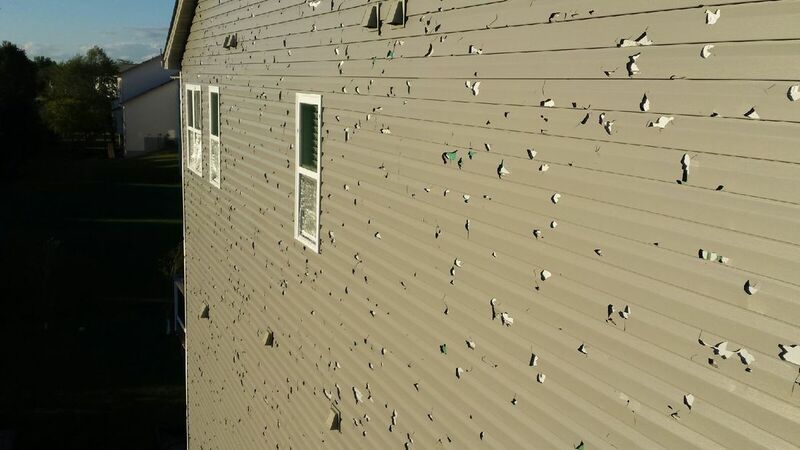 A hailstorm can significantly damage your home, from roof, siding, windows, or gutters/fascia it can definitely leave behind substantial damage. The important step you as a homeowner need to take, is contact us right away, to make sure your insurance company will pay you the right amount of money you deserve in order to restore the damage. Most insurance companies will only give homeowners 1 year to make any claims for repairs. We are experts in hail damage inspections and repairs of any size. The impact of hail can loosen, fracture, or remove granules from your asphalt shingles. The granules protect the asphalt matting of your shingles from sunlight and UV light. The asphalt will deteriorate very quickly once exposed to the sun. This is the reason a hail-damaged roof will prematurely fail. Hail damaged roofs may or may not show up immediately as visual damage to the inexperienced observer. The results of a hailstorm will void the shingles manufacturer's warranty, as they cannot warranty against "Acts of God" such as hailstorms. Just as severe and destructive can be high and strong winds. Wind damage can result in blown off shingles, damage to your soffit & fascia; often times power lines being cut to the ground or trees that fall down on roof, windows, siding, etc. Don't wait to call us after a storm hits and damages your home, that damage can turn into bigger issues, like causing leaks, which in the end will cost more to repair. We are the experts you need to restore and repair any kind of storm damage, with the highest quality assurance making you a happy camper. According to NOAA’s Severe Storm database, the states that typically have the highest hail risk include Colorado, Iowa, Kansas, Minnesota, Missouri, Nebraska, Oklahoma, South Dakota, Texas, and Wyoming. Peak months for high hail activity are historically March, April, May, and June. Hail can originate from any thunderstorm, but large hail is most common in rotating thunderstorms called super cells. Nearly all super cells produce hail, while less than 30% super cells produce tornadoes. Hail causes about 1 billion dollars in damage to property and crops each year. Hailstorms do not usually cause fatalities, but approximately 24 people are injured each year by hail in the US. The largest hailstone in terms of diameter and weight ever recorded in the U.S. fell on July 23, 2010, in Vivian, South Dakota; it measured 8 inches in diameter and 18.62 inches in circumference, weighing in at 1.93 pounds. Hailstones can vary from pea size up to grapefruit size or larger.